Frija-Masson et al. reveal, in this issue of the European Respiratory Journal, the presence of lymphoid follicles in peribronchial areas of the lungs from patients with cystic fibrosis or with localised bronchiectasis, following careful examination of their structures including B- and T-cells, germinal centres and high-endothelial veinules. In addition, by using an elegant murine model of instillation of microbeads coated with Staphylococcus aureus or Pseudomonas aeruginosa, they were able to recapitulate in these mice the formation of lung lymphoid follicles upon persistent infection. Furthermore, they highlighted in both situations (patients with bronchiectasis and infected mice) increases in IL-17 and the B-cell-attracting chemokine CXCL13 and, to some extent, CXCL12. Accordingly, another recent study reported the presence of lymphoid follicles in the lungs of patients with end-stage cystic fibrosis, localised in peribronchial as well as in parenchymal and perivascular areas . The mechanisms of lymphoid neogenesis remain poorly understood, notably in the lung. It has been shown that the B-cell chemokine CXCL13 is upregulated in COPD and pulmonary hypertension, as well as in smoking mice [5, 11], presumably produced by stromal fibroblasts and attracting (in areas with abundant reticular fibres and collagen IV) mature B-cells and a subset of follicular T-helper cells which express high levels of its receptor CXCR5. Importantly, CXCL13 is probably induced following lymphotoxin-β receptor activation and early upregulation of the IL-1α pathway, as recently shown following influenza infection of mice . Other B-cell chemokines, such as CXCL12 and CCL19, 20 and 21, probably also contribute to attract circulating CCR6+ CXCR5+ B-cells to lung lymphoid follicles [5, 13], while factors such as B-cell activating factor further promote B-cell survival and immunoglobulin synthesis . The role of lung lymphoid follicles remains debated [15–17], as they can probably be viewed as beneficial or detrimental according to the primum movens, and thereby to the context, of their genesis relating to immune protection against pathogens or autoimmunity against self-antigens. In the model of influenza infection, a protective role of iBALT and secreted antibodies can be demonstrated . The role of bacteria as inducers of lymphoid follicles in the lung has first been reported by Delventhal et al. following instillation of Haemophilus in the lungs of pigs. This was reproduced by Fleige et al. upon repeated instillations of P. aeruginosa in mice, which induced BALT following IL-17-driven CXCL12, despite the absence of follicular dendritic cells, in contrast to BALT induced by the modified vaccinia virus Ankara. The results of the study reported by Frija-Masson et al. rather suggest that the recruitment/differentiation of these dendritic cells, observed in lymphoid follicles induced by both P. aeruginosa and S. aureus, depends on the persistence of the bacterial trigger rather than the nature of the pathogen. The chronicity is thus a key issue, very relevant to cystic fibrosis lung disease, which is usually characterised even at early stages, by the chronic or repeated presence of opportunistic pathogens in the lung. These infection-induced lymphoid follicles are presumably beneficial, at least in part, by providing adaptive responses to bacteria (e.g. to P. aeruginosa) which can be seen in most adult cystic fibrosis patients [21, 22] and, in clinical practice, serum anti-P. aeruginosa antibodies may help to assess the chronicity of P. aeruginosa infection, along with Leed's criteria . In contrast, at the other end of the spectrum, autoantibody production associated with some phenotypes of chronic lung diseases could play a pathogenic role, as reported in pulmonary hypertension . This dichotomic view of infection-versus autoimmunity-related neolymphogenesis is however challenged by recent observations in cystic fibrosis. Although bacterial infection was for long suspected to induce BALT in the cystic fibrosis lung, as nicely confirmed herein using appropriate tools , autoantibodies to bactericidal permeability-increasing protein (BPI) as well as to carbamylated proteins are frequently found in patients with cystic fibrosis (up to 80% of cases) and correlated with worse prognosis in terms of mortality, lung function, exacerbations and pan-resistant P. aeruginosa . Interestingly, a recent study unravelled that P. aeruginosa-mediated formation of neutrophil extracellular traps results in BPI cleavage by P. aeruginosa elastase , suggesting a novel mechanism of autoimmunity and indicating that complex relationships link infection, (neutrophilic) inflammation and autoimmunity in the cystic fibrosis lung (figure 1). Schematic overview of peribronchial lymphoid follicles in the pathophysiology of cystic fibrosis. Upon activation by lymphotoxin (LT)-β and interleukin (IL)-1α, airway epithelial and mesenchymal cells secrete chemokines that attract B-cells and contribute to local lymphoid neogenesis. Lymphoid follicles are probably the site of adaptive immunity for the production of anti-Pseudomonas (PA) antibodies as well as anti-bactericidal permeability-increasing protein (BPI) autoantibodies, which are presumably beneficial or detrimental, respectively. Images from Servier Medical Art were used to generate this figure. CFTR: cystic fibrosis transmembrane conductance regulator; TGF-β; transforming growth factor-β; MBL-2: mannose-binding lectin 2; SLC6A14: sodium- and chloride-dependent neutral and basic amino acid transporter B(0+); BAFF: B-cell activating factor; CXCL: chemokine (C-X-C motif) ligand. The next question we need to answer to restore the delicate balance for mucosal tolerance and immunity in the lung, is how can we intervene in cystic fibrosis to transform lymphoid follicles into true friends by switching off the production of autoantibodies and promoting the protective response by anti-bacterial antibodies? Besides sterile pathogenic mechanisms operating in cystic fibrosis , addressing these issues may pave the way for current and future studies of the complex interactions between bacteria and airway host tissues in the chronic diseased lung, which probably underlie disease severity, and for which Frija-Masson et al. have laid an important foundation stone.
. Is the bronchus-associated lymphoid tissue (BALT) an integral structure of the lung in normal mammals, including humans? Am J Respir Cell Mol Biol 1990; 3: 131–135. B-lymphocyte lineage cells and the respiratory system. J Allergy Clin Immunol 2013; 131: 933–957. Presence of B cells in tertiary lymphoid structures is associated with a protective immunity in patients with lung cancer. Am J Respir Crit Care Med 2014; 189: 832–844. Pulmonary lymphoid neogenesis in idiopathic pulmonary arterial hypertension. Am J Respir Crit Care Med 2012; 185: 311–321. Immunological diversity in phenotypes of chronic lung allograft dysfunction: a comprehensive immunohistochemical analysis. Transpl Int 2017; 30: 134–143. Aggregations of lymphoid cells in the airways of nonsmokers, smokers, and subjects with asthma. Am J Respir Crit Care Med 2004; 169: 712–718. End-stage cystic fibrosis lung disease is characterised by a diverse inflammatory pattern: an immunohistochemical analysis. Respir Res 2017; 18: 10. Role of CXCL13 in cigarette smoke-induced lymphoid follicle formation and chronic obstructive pulmonary disease. Am J Respir Crit Care Med 2013; 188: 343–355. Early IL-1 signaling promotes iBALT induction after influenza virus infection. Front Immunol 2016; 7: 312.
. The role of lung dendritic cell subsets in immunity to respiratory viruses. Immunol Rev 2013; 255: 57–67. B cell-activating factor. An orchestrator of lymphoid follicles in severe chronic obstructive pulmonary disease. Am J Respir Crit Care Med 2015; 192: 695–705. Lymphoid follicles in (very) severe COPD: beneficial or harmful? Eur Respir J 2009; 34: 219–230.
. “B” for bad, beneficial, or both? Lung lymphoid neogenesis in chronic obstructive pulmonary disease. Am J Respir Crit Care Med 2015; 192: 648–651. 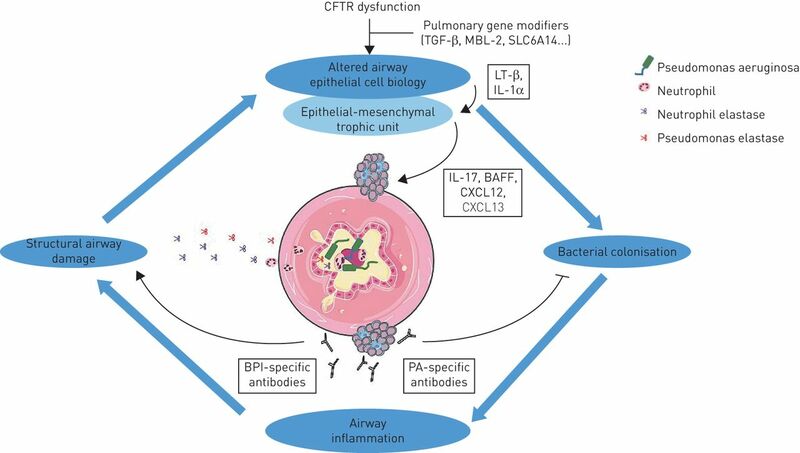 Role of inducible bronchus associated lymphoid tissue (iBALT) in respiratory immunity. Nat Med 2004; 10: 927–934. Effects of microbial stimulation on the number, size and activity of bronchus-associated lymphoid tissue (BALT) structures in the pig. Int J Exp Pathol 1992; 73: 351–357. IL-17-induced CXCL12 recruits B cells and induces follicle formation in BALT in the absence of differentiated FDCs. J Exp Med 2014; 211: 643–651. Bronchoalveolar lavage findings in cystic fibrosis patients with stable, clinically mild lung disease suggest ongoing infection and inflammation. Am J Respir Crit Care Med 1994; 150: 448–454. Secretory IgA as a diagnostic tool for Pseudomonas aeruginosa respiratory colonization. J Cyst Fibros 2013; 12: 81–87. Bronchus-associated lymphoid tissue in pulmonary hypertension produces pathologic autoantibodies. Am J Respir Crit Care Med 2013; 188: 1126–1136. Prevalence and clinical significance of auto-antibodies in adults with cystic fibrosis. Eur Respir J 2009; 34: 1079–1085. The role for neutrophil extracellular traps in cystic fibrosis autoimmunity. JCI Insight 2016; 1: e88912. Hypoxia and sterile inflammation in cystic fibrosis airways: mechanisms and potential therapies. Eur Respir J 2017; 49: 1600903.